Villa Pacifica is an absolute paradise that has been able to utilize attractive Mexican decor to create a masterpiece like no other. This is perhaps one of the most beautiful homes you will ever visit. It offers hand-painted tiles, white walls, handcrafted tools, stunning archways and an abundant amount of light that will make you feel warm all over. The wide open room which features the living and dining area offers sliding glass doors that span the entire space of the room that allows for a breathtaking view of the Sea of Cortez and the pool terrace. As one steps through the glass doors the large open space of the grand room extends to the outdoor dining area. As one walks down a few steps they will find the infinity pool surrounded by lush green grass. And then it is just a moments walk to the warm sandy beach sitting at the clear blue ocean’s edge. Adjacent to the living and dining areas one will find the impressive Mexican tile kitchen which is complemented by warm wood. The bedrooms are large and filled with bright colors along with warm accents and tones. The bathroom features beautiful hand-painted Mexican files complemented with unique colors and design. 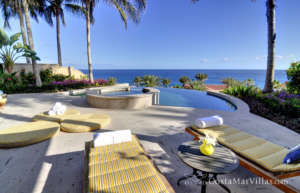 When you book this incredible luxury villa, which can be found in the exclusive Palmilla community, you will also have access to the secluded golf and tennis clubs of the area. It should be noted that there may be additional fees with these activities. Your concierge will be able to assist you with reservations as well as tee times. It is advisable to request reservations from One & Only and understand that those are subject to availability and confirmation from One & Only Palmilla hotel. The gym and pool areas located on the One & Only Palmilla hotel property are restricted to hotel guests only. 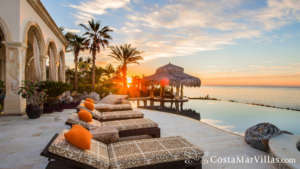 The design of Villa Pacifica has been able to provide an incredible balance between the latest and enmities and the traditional decor of Mexico and placed it directly on the beach in a luxurious setting. 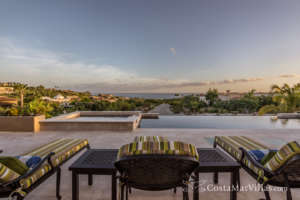 The villa is situated minutes from Porto Los Cabos golf course as well as the gallery district, allowing this oceanfront vacation rental to be the perfect location for the entire family. Situated in this setting, there is something for everyone. If you are a fan of swimming in pools or the gorgeous ocean waters, you will find both within minutes of your door at Villa Pacifica. 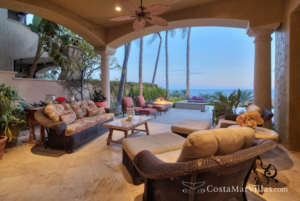 The open room features full-length sliding glass doors that spanned the entire length of the room allowing for an incredible view of the picturesque Sea of Cortez. As one leaves the great room the feeling of space is extended into the immediate dining area that is found outside which features a wet bar and barbecue. Your reservation at Villa Pacifica will also include 24-hour security and immaculate housekeeping. As you walk through the interior of Villa Pacifica you will feel a sense of warmth for the abundance of white found within the Villa as well as the warm colors and handcrafted woods. The large kitchen boasts beautiful Mexican tiles that make it a joy to create incredible meals. The open floor plan is beautifully decorated with comfort in mind for the body and mind. The main house includes four large bedrooms, while there are two located in the guesthouse. The bedrooms offer bright colors in conjunction with form accents. Each of the bathrooms has been tastefully decorated and features Mexican hand-painted tiles in a sophisticated color. Due to the prime location of the Villa Pacifica, it has become one of the hottest spots for anniversaries and weddings. Not far you’ll find son José Del Cabo which is a beautiful colonial town where some of the areas best surfing can be found. If you travel north east, you will arrive at East Cape, which is one of the best spots for birdwatching and fishing. When you arrive in Cabo son Lucas, you will have the opportunity to be inspired by El Arco and then dance the night away.